Christ is the source of our life, the source of our immortality. He is the tree of life, and to all who come to him he gives spiritual life. "Verily, verily, I say unto you," he declared, "Moses gave you not that bread from heaven; but my Father giveth you the true bread from heaven. For the bread of God is he which cometh down from heaven, and giveth life unto the world. . . . I am the bread of life: he that cometh to me shall never hunger; and he that believeth on me shall never thirst. . . . Verily, verily, I say unto you, He that believeth on me hath everlasting life. . . . I am the living bread which came down from heaven: if any man eat of this bread, he shall live forever: and the bread that I will give is my flesh, which I will give for the life of the world. The Jews therefore strove among themselves, saying, How can this man give us his flesh to eat? Then Jesus said unto them, Verily, verily, I say unto you, Except ye eat the flesh of the Son of Man, and drink his blood, ye have no life in you. Whoso eateth my flesh, and drinketh my blood, hath eternal life; and I will raise him up at the last day. For my flesh is meat indeed, and my blood is drink indeed. He that eateth my flesh, and drinketh my blood, dwelleth in me, and I in him. . . It is the Spirit that quickeneth; the flesh profiteth nothing: the words that I speak unto you, they are spirit, and they are life." Jesus said: "Verily, verily, I say unto you, Ye seek me, not because ye saw the miracles, but because ye did eat of the loaves, and were filled. Labor not for the meat which perisheth, but for that meat which endureth unto everlasting life, which the Son of Man shall give unto you: for him hath God the Father sealed." "They said therefore unto him, What sign showest thou then, that we may see, and believe thee? what dost thou work? 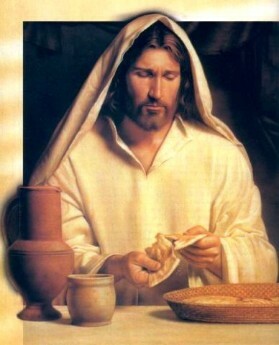 Our fathers did eat manna in the desert; as it is written, He gave them bread from heaven to eat. Then Jesus said unto them, Verily, verily, I say unto you, Moses gave you not that bread from heaven; but my Father giveth you the true bread from heaven. For the bread of God is he which cometh down from heaven, and giveth life unto the world. Then said they unto him, Lord, evermore give us this bread. And Jesus said unto them, I am the bread of life; he that cometh to me shall never hunger; and he that believeth on me shall never thirst."